Shorter planks this week, but they seem to be better quality. Planking continues pretty much as instructions. You can see both sides of the stern, and you'll notice that the gaps on each side are slightly uneven. This was just how the planks wanted to lay and I didn't see any point in forcing them. It's as easy to fill 2 small gaps as it is one large one. The first plank that goes round the stern needed steaming. An easy job with a kettle (non-automatic, otherwise it switches itself off and you don't get any steam.) but mind your fingers. Just warm the plank in the steam and bend it gentle and evenly till it matches the curve of the stern. Tape it in place and let it dry before gluing it in place. 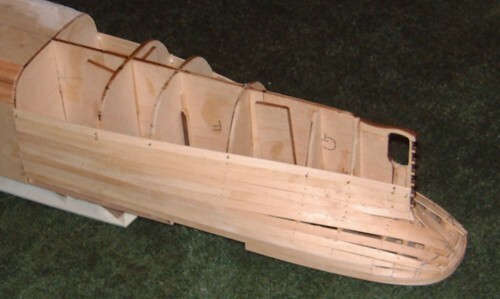 Plank each side evenly to stop the model warping. I always let each plank dry before doing the next one and wipe away any excess glue. 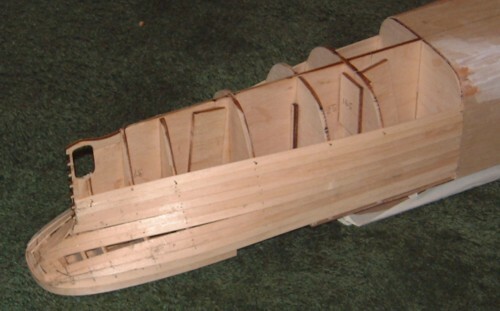 The rudder carrier went on just before the planks started to cover it. It looks quite fragile, so it went on at the last possible moment. You can see some filler in the second photo. That's car body filler - I had some left over from another job. Bear with me on this subject - I'm still wondering about the best thing to use. 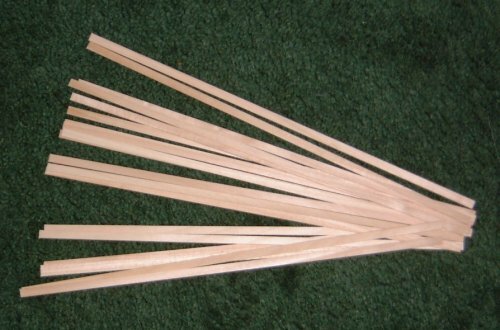 Car body filler would seem ideal, as long as you can glue the raised planking to it. I want to try it before recommending it. If anybody has a better idea - please let me know. This weeks tip is from Gordon Davie. likely to spoil the appearance of the card. hull frames are removed from the main sheet (where the location slots are). you'll get a firm bond. Thanks Gordon - an excellent idea. One more tip. When you're planking the hull, the edges of the deck are vulnerable to knocks and breaks. They can be protected with masking tape, which you can see in the photos above.